The daymare of selling my home is almost over… for now. The contract with my, let me say “eccentric” real estate agent is up on August 7 and I am more than happy about that–not so happy about not having sold the house yet. I have tried just about everything within my budget to get this circa 1911 cape staged and sold and nothing seems to work. I think it’s partly the artsy old vintage roofline closets but I can’t afford to change them. So, I’ve decided to blame the agent, do some more repairs while it’s off the market, restage, get a new agent, hike up the selling price and get this baby sold! I am determined to start making things again very soon and posting again and getting sane again (not necessarily in that order–then again maybe in that exact order). 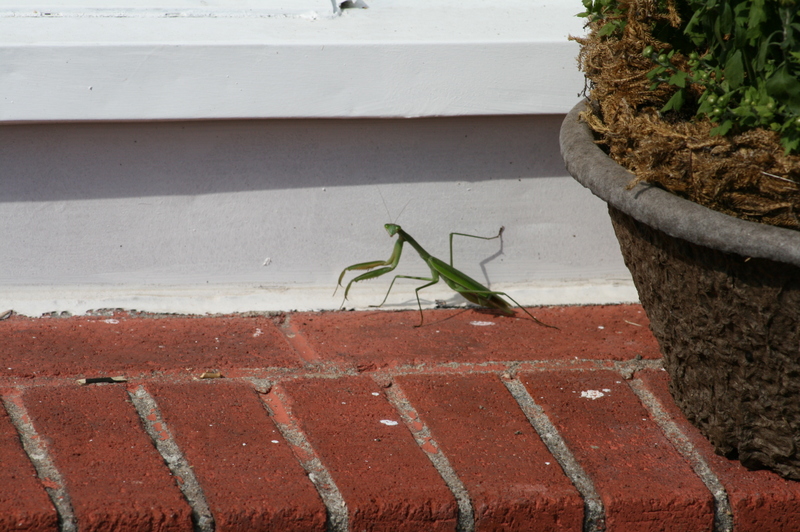 A little mantis came to visit. Good luck perhaps?